Nintendo’s new video game console, the Nintendo Switch, came out earlier this month. As with their previous consoles, Nintendo has changed up its formula for their new console. 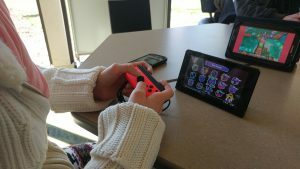 Kent Springborn Jr. | The Collegian | A LCCC student plays a game called “SnipperClips” on the Nintendo Switch in the Gamers’ Lounge. The Switch is a combination of a home console and a portable gaming system. This allows you to play while connected to a television and on the go, which is a first when it comes to the video gaming market. Innovation has always been one of Nintendo’s primary focuses. When compared to Microsoft’s Xbox One and Sony’s PlayStation 4, the Switch might not be as powerful, but it’s currently the only one that functions as a hybrid. This setup has its pros and cons. As for me, I like the idea of being able to take the game I’m currently playing at home on the go. It allows for practically seamless playing. Though since I’m more of an “on-the-go” kind of player, I’ve found myself playing the Switch in its portable mode more often than its home mode. However, the low battery life when playing “The Legend of Zelda: Breath of the Wild” is frustrating. This forces the player to charge the console, which isn’t necessarily a bad thing since it’s the dock that allows for the console to be played while connected to a television. In terms of the Switch’s controllers, there are currently two options. The console comes with two Joy-con controllers, a left Joy-con and a right Joy-con. The Joy-cons can function as a single controller or two individual controllers. They’re smaller than what one might expect, but they’re also surprisingly comfortable to hold. The second controller option is the Pro Controller, which is a more traditional controller most gamers might be used to. One major downside to either controller option is the price, which is especially frustrating in multiplayer situations. There have also been reports of the left Joy-con desyncing with the Switch, but I have yet to experience that myself. The Switch shows a lot of potential as Nintendo’s newest home console and portable hybrid. It could also pave the way for the future of the video game industry depending on which direction it goes. I personally hope to see it succeed and not suffer like Nintendo’s previous console, the Wii U.